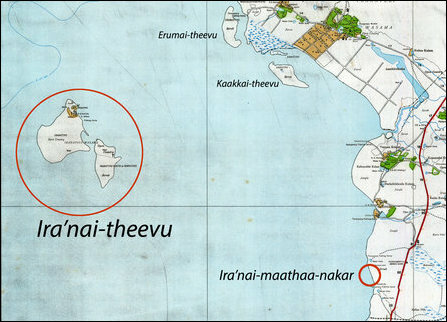 The Chief Minister of the Northern Provincial Council on Monday visited the twin-islet of Ira'nai-theevu giving recognition to the courageous move of the uprooted people, who had reached their twin-islet last month after waging a continuous protest for almost one year. 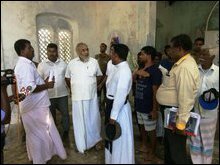 The people, staying at the church and the school, were encouraged by the visit of Justice C.V. Wigneswaran, who proclaimed that no one could deny the people their right to resettle in their native islet. 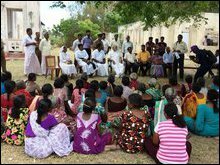 The SL Navy seems to be having its base in an area of 3 acres, and it should not restrict the people to access the residential lands. 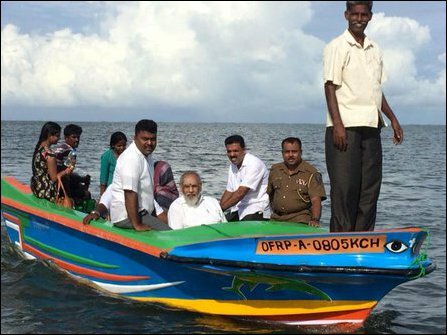 The coastal stretch which is essential for their livelihood should also be free from naval restrictions, the members of NPC delegation who accompanied Justice Wigneswaran told TamilNet. No one has the authority to chase them away from the islet anymore, Justice C.V Wigneswaran said after witnessing the situation at Ira'nai-theevu. 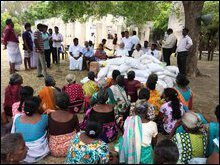 NPC Education Minister K. Sarweswaran, Councillor and former NPC Minister of Agriculture P. Ayngaranesan, Councillor B Gajatheepan and the chief secretary of the CM accompanied him with dry rations. Justice Wigneswaran also explained to the people how the NPC had been restricted from exercising even the powers accorded to it through the 13th Amendment. 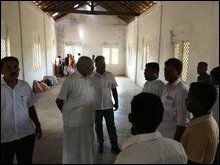 However, the NPC CM promised to address their concerns by sending a written request to the SL Defence Ministry and the SL Resettlement Ministry. The uprooted people urged the NPC to facilitate transport, resume education, healthcare and other infrastructural arrangements according to its capacity.